Sunday was a nightmare for travel. The world's busiest airport, Hartsfield-Jackson Atlanta International Airport, was crippled when it lost power for 11 hours. That meant over 1,150 departing or arriving flights were canceled, planes sat on the tarmac for several hours, and the failure affected at least 30,000 people. The power failure happened around 1pm and is believed to have been caused by a fire, according to a report by The New York Times. By around midnight on Sunday into Monday, all terminals had power again, but the mood inside the airport was decidedly apocalyptic. Chick-fil-A showed up with free sandwiches and water eventually, but even complimentary chicken can only do so much. 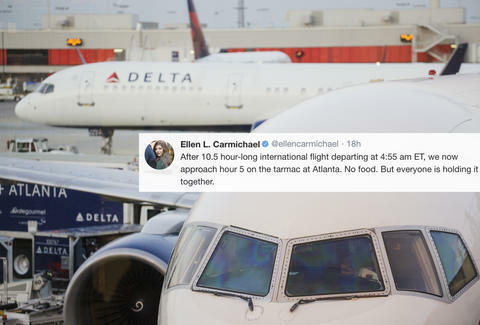 As you'd expect, harrowing scenes from the massive blackout quickly emerged on Twitter, as stranded passengers posted live updates of their travel nightmares while stranded in the airport's terminals or in some cases from onboard planes stuck on the tarmac. Check out the tweets below for an overview of the whole miserable experience, and thank your lucky stars that you were far away. Hundreds of passengers were stuck on the tarmac with no indication of when they'd be able to deplane. Pilot is walking around. Says we have 1-2 more hours - slow because there are only 5 sets of stairs and dozens of planes to unload. And they're not sure where they'll take us once we're off. He also says there are people stuck inside the airport's TRAM. Right now, our pilot is just chilling at the back of the plane since there’s nothing he or we can do. He’s super nice - but some of us really wanna get outta here! Arriving and departing were equally terrible. Those on international flights were in particular trouble because customs had no power. Hi yes I would like to order a pizza the delivery address is the Atlanta airport runway. Landed hours ago from Germany can’t get off plane bc customs and outage but could customs clear a pizza to come on board? Inside, no one knew what to do or who was in charge -- and food was lacking. On one flight, country singer John King covered Tom Petty over the plane's intercom in an attempt to lighten the mood. The airport itself was so congested that workers were sliding down escalators. Finally, the mayor called in Chick-fil-A, which served sandwiches and water even though it's famously closed on Sundays, and the power was restored. It may not have been a miracle but it definitely made a horrible day slightly better. James Chrisman is a News Writer at Thrillist who is never going to an airport again. Send news tips to news@thrillist.com and follow him on Twitter @james_chrisman2.